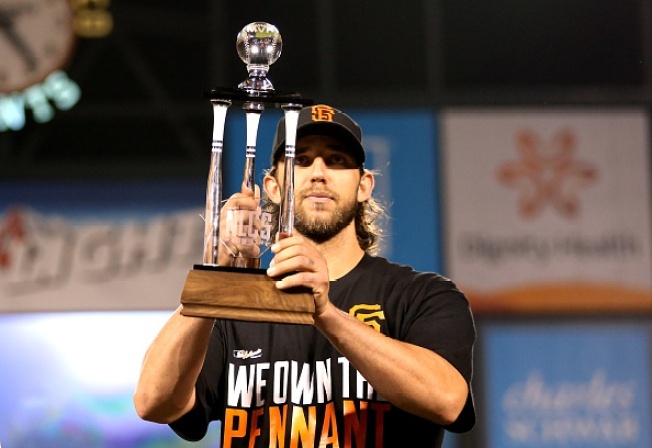 The big man they call MadBum is a playoff MVP. Madison Bumgarner was chosen Most Valuable Player of the NL Championship Series on Thursday night following his latest display of postseason poise for the San Francisco Giants. The 25-year-old lefty tossed eight solid innings in Game 5 and took home the prize after San Francisco rallied for a 6-3 victory over the St. Louis Cardinals on Travis Ishikawa's three-run homer in the bottom of the ninth. Bumgarner pitched shutout ball in a Game 1 win at St. Louis, getting the Giants off to a fast start in a best-of-seven series they won 4-1. Now, they're headed back to the World Series for the third time in five years, looking to add to the championships they captured in 2010 and 2012. 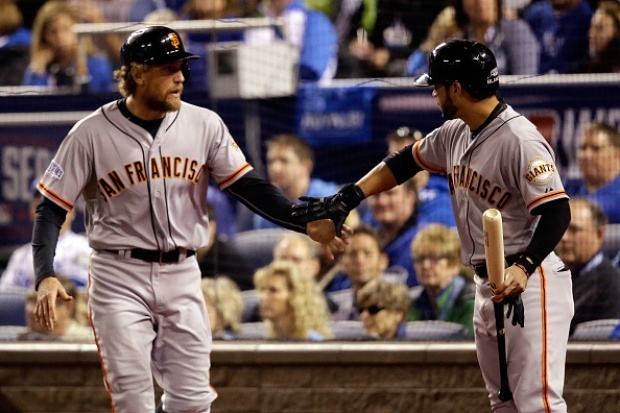 Bumgarner and the Giants will open the Fall Classic in Kansas City on Tuesday night. "I really like the group of guys that we have here, and it's going to be a fun series,'' said Bumgarner, who earned a $75,000 bonus for winning the award. He gave up two homers in Game 5 against St. Louis but retired his final 13 batters to keep the Giants close, winding up with a no-decision. San Francisco Giants fans celebrated outside AT&T Park after the team defeated the St. Louis Cardinals to take the NL pennant and advance to the World Series. Aside from an uncharacteristic blip in Game 3 of the NL Division Series against Washington, the shaggy-haired southpaw has been stellar in his third postseason. The Giants' remarkable 10-game postseason winning streak ended on one bad toss by their best pitcher when Bumgarner's wild throw past third base after fielding a bunt helped the Nationals rally. San Francisco still advanced, and Bumgarner went 7 2-3 innings for a 3-0 victory in the NLCS opener at Busch Stadium. The 18-game winner has thrived in this postseason for a Giants team down a pair of pitching stars that helped carry them to their previous two titles. Right-hander Matt Cain is recovering from elbow surgery, and Tim Lincecum was demoted to the bullpen and has not been used in October. At 6-foot-5 and 235 pounds, Bumgarner is a huge reason the Giants keep winning. He tossed a four-hit shutout with 10 strikeouts in an 8-0 victory at Pittsburgh in the NL wild-card game, and has kept that momentum going. Now, he gets to lead the Giants into the World Series for a third time -- and he has certainly shined on that stage before. The two-time All-Star has thrown 15 scoreless innings in World Series play, winning both his starts while striking out 14 and yielding five total hits.